February 15, 2012 Adri H.
Ruffles! 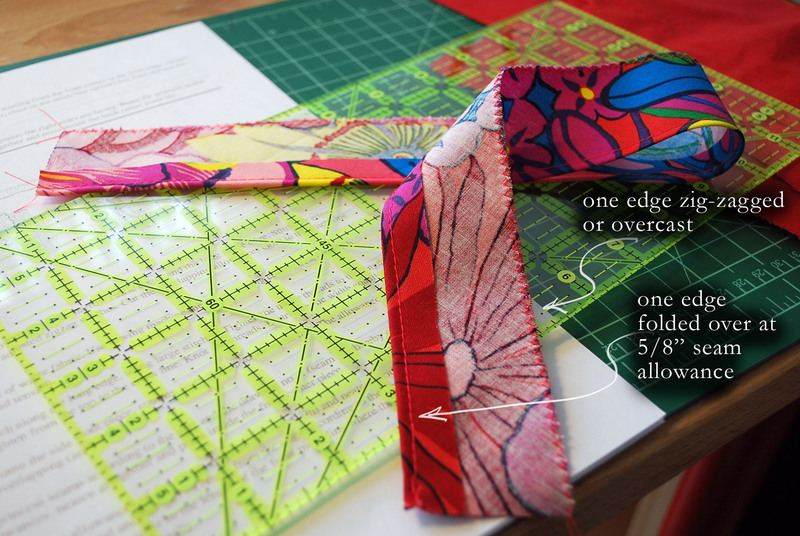 In the previous part (part 1) of this tutorial, we cut out all the pieces, worked on the buttonhole band, and briefly mentioned that the center back piece was attached to the back side pieces using your preferred seaming method. In this portion of the tutorial, we cover Steps 7 through 9 of the JJ Blouse, a free pattern from BurdaStyle. Note: I actually skipped Step 9 which is the belt loops. I chose not to include them. (A) The ruffles begin as flat pieces. First the seam allowances on the longest side are folded up, pressed, stitched about 1/8" away from the edge, then trimmed down on the wrong side. Then fold the side edges over and stitch 1/8" away from the edge. 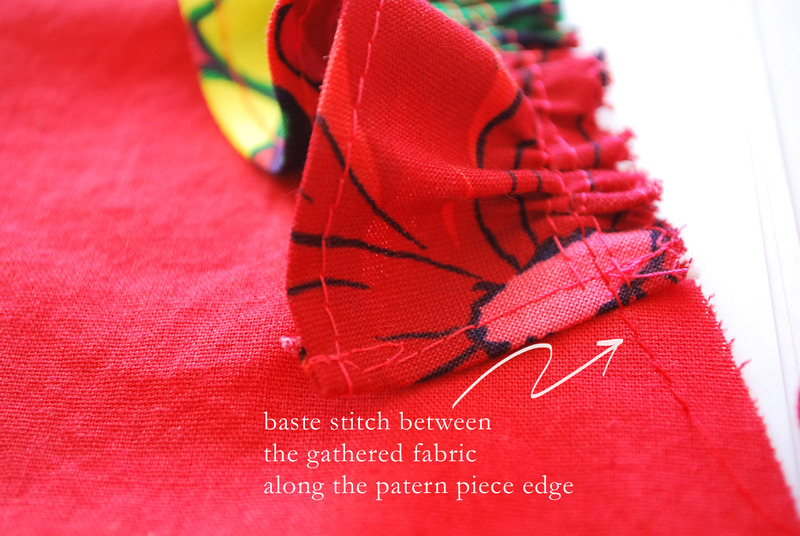 The untreated edge should be zig-zag stitched to keep the fabric from fraying. (B) Double-stitch close to the zig-zagged edge. Try to keep the two rows of stitching as parallel to one another as possible. Separate the top threads from the bottom threads. Hold the bottom two threads on one side, and slide the fabric away from the bottom threads. I measured the two marks on Piece #2 (dot 1 to a bar along the stitch line). Then, I scrunched from the opposite side until the ruffle was the required length. Afterward, I evened out the fullness of the ruffles. 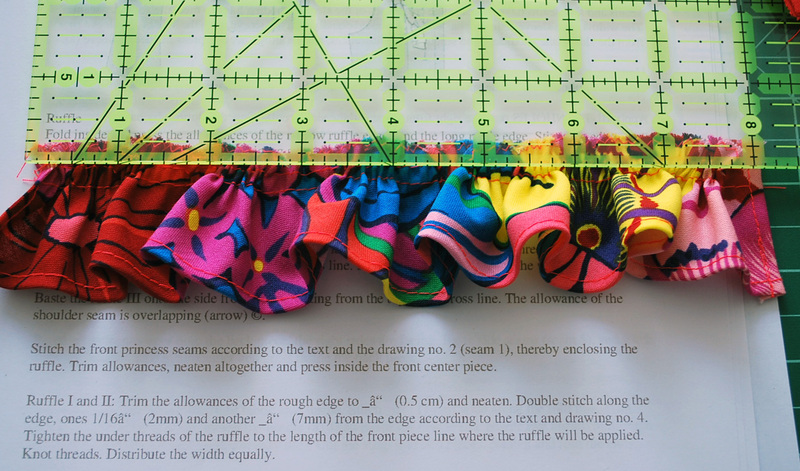 (C) Next, baste the ruffle onto the edge of piece #2 with the RS of the ruffle and the garment facing up, and the edge of the ruffle along the edge of the pattern piece perfectly between the two marks. (D) Sew the princess seams, piece #1 to piece #2 the one that has a ruffle attached to it w/right sides together. This is one seam I didn't flat-fell. Proceed with the next ruffles should you wish to add them. I only did four ruffles instead of the intended six. Baste the shoulder seams with right sides facing. If you're doing flat-felled seams, try on the garment now to make sure the everything fits properly and your waist/hips/etc will work out... here's where you can make changes should you have to. If you've made changes to the neckline, adjust your collar accordingly. 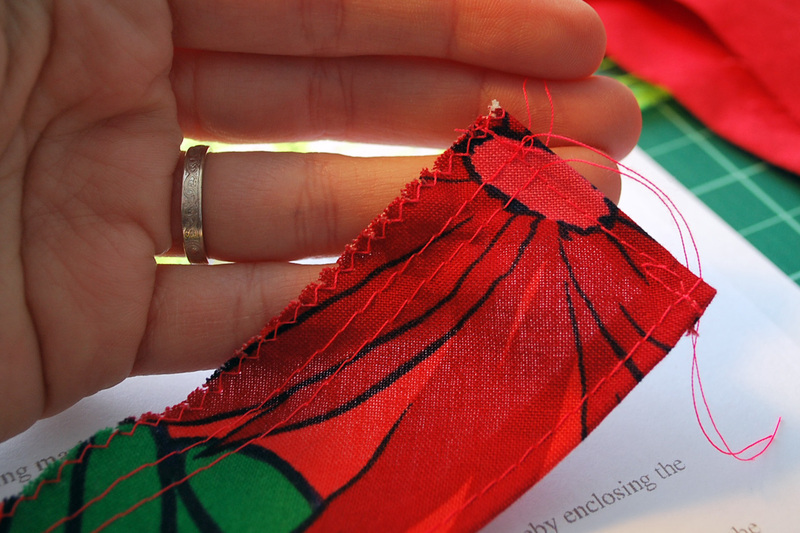 If you've made changes to the shoulder-line or side seams, be sure to finish your edges before proceeding. Then comes the collar. 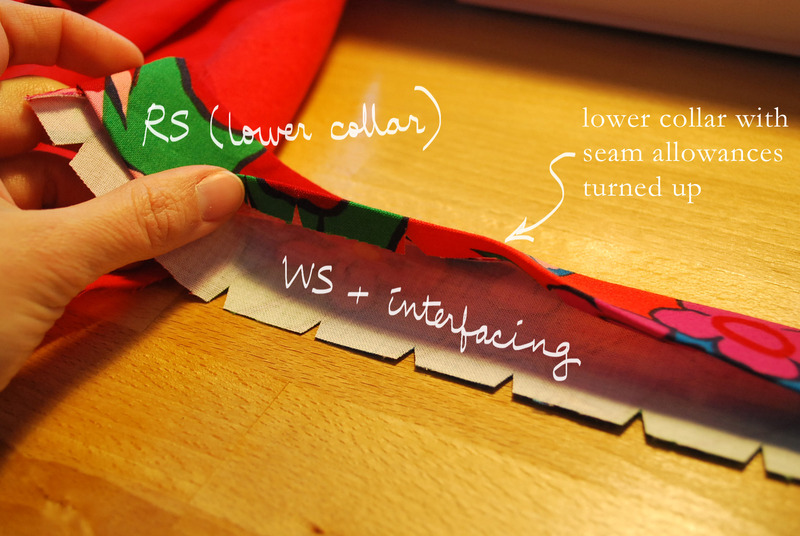 If you haven't already ironed the interfacing onto the wrong side of one of the collar pieces, do so now. The collar piece without the interfacing is called the "lower collar" piece. Next, with right sides facing, baste three seams (two sides and the upper/top/smaller curve). Leave the lower, longer curve un-sewn. 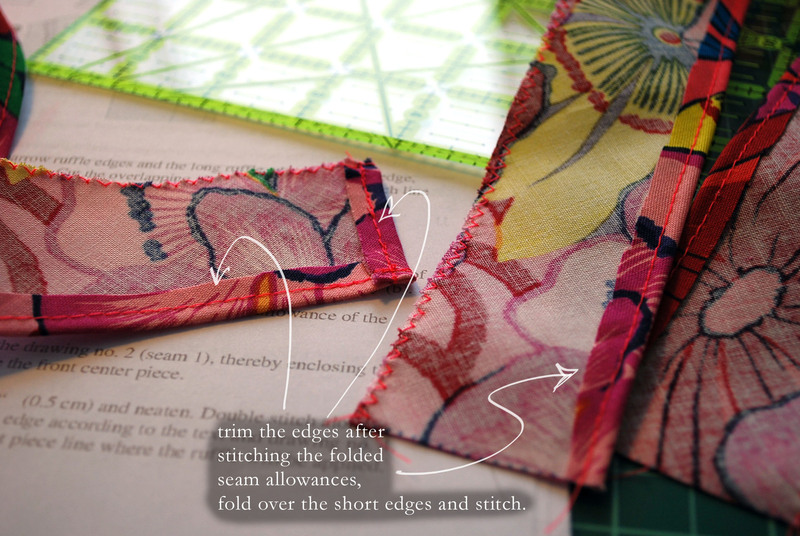 Trim the allowances of the basted edges, clipping/notching where necessary. Prep the corners to be turned inside out. Turn collar inside out, baste the three edges about 1/8" from the edges, and press. Collar still has one open edge... I did this incorrectly and did all four sides. Oops. Here's the tricky collar part that I did not photograph because I did not leave the collar open. Align the edge of the collar with the button band dot 4 (remember dot 4 from Part 1 of the tutorial?). Pin and test to be sure your collar is correctly aligned, and that the marks are all matching. 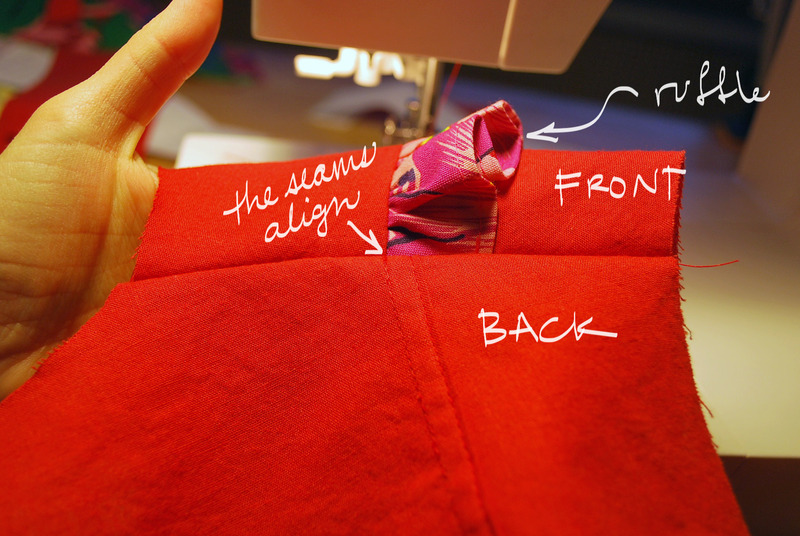 The marks on the sides of the collar should match the shoulder seam intersection. The instructions are pretty clear in the third paragraph of Step 8... when they say "stitch narrowly" they mean stitch 1/8" from the edge (or close to the edge). I didn't do this step. The belt loops just didn't catch my eye. The instructions here are clear enough, though, should you want to attach belt loops. 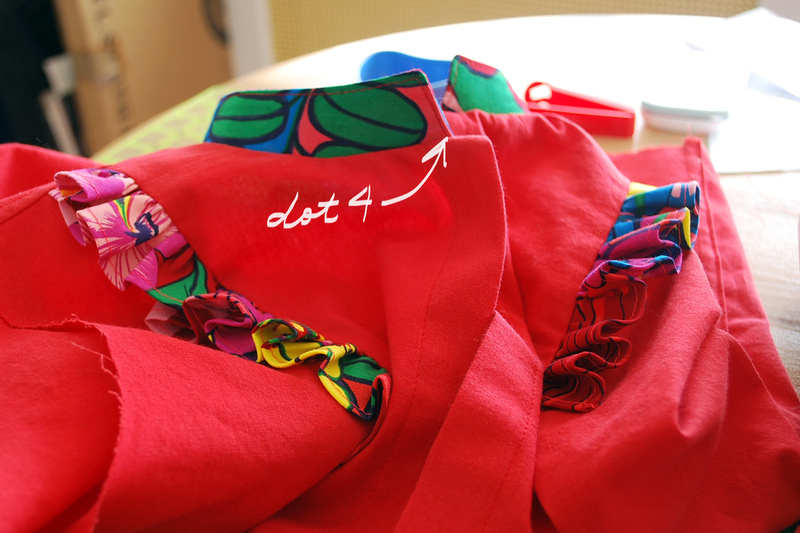 Steps 10 through 12 are in the third and final installment of this JJ Blouse Tutorial.